‘My aim is to put down on paper what I see and what I feel in the best and simplest way.’ Ernest Hemingway. I am often asked where my literary inspiration comes from. Anywhere, everywhere, from people I meet on a daily basis, to people I befriended on my travels. People inspire me, writers inspire me. I took these photos while visiting Andalusia in the province of Malaga in southern Spain. Andalusia is known for its natural beauty and its bull-fighting traditions. And of course, Ernest Hemingway. Ernest Miller Hemingway (Papa as he was known to those who knew him well) was born in Oak Park, Illinois, USA on 21 July 1899 and died by his own hand 2 July, 1961. Hemingway spent his last birthday in Andalusia, accredited to be the last time he was happy before he took his own life. It wasn’t bull-fighting season when I visited Ronda and I was grateful. I doubt I would have had the stomach for it. What about you? Where do you find your inspiration? 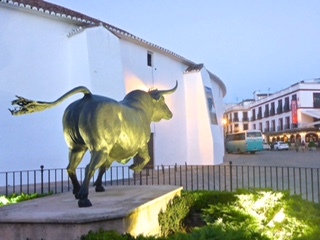 This entry was posted in Mental Health, Posts and tagged books, Bullrings, HEMMINGWAY, INSPIRATION, Spain. Bookmark the permalink. 7 Responses to WHERE DOES YOUR LITERARY INSPIRATION COME FROM? My muse is fickle. I find my inspiration at the oddest moments and time. Tonight it was in stumbling across an old photo album. At other times, could be traveling. Many times, while driving or in the shower. My muse has a sense of humor and likes to hit me at times I cannot get to a keyboard or a pen:). Isn’t that frustrating when you have a great idea and can’t find a pen and paper. It usually happens to me in the middle of the night when I’m half asleep. Nice memorial post for Hemingway. Apropos my inspiration, I often start with the visual, too. For characters I look at faces in the media or around me in coffee shops or on public transport, and imagine what their appearance suggests. For story or non-fiction I assume the persona of an alien and begin to think, “What would happen if…” or “Why do we assume this…”. But for me, ideas never just come. I have to deliberately go looking. I like that you take on an alien life form. That in itself is a good idea for a story! I need about three random streams of interest to cross e.g. assisted dying, actor’s exercises, a visit to Slovenia (my last novel). I lived in Gibraltar as a child in the 50s. 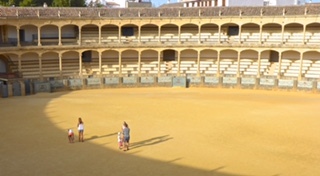 On later visits to Spain my father took us to a bullfight… it was pretty terrifying in all senses. If you read Hemingway first, you can get a feel for the challenge, the beauty and the pageant, but it is an unfair contest, since the bull always dies, though of course the matador occasionally does too. Thanks for your interesting comment Hilary. Living in Gibraltar must have been quite an experience. I travelled there last year and spent half a day exploring. I would have loved to have spent more time there. The bullfight with its pageantry and sense of theatre, man vs beast is powerful stuff but as you say behind all that imagery lies death.